First of June, first truly full day in Iceland, and a busy one at that. 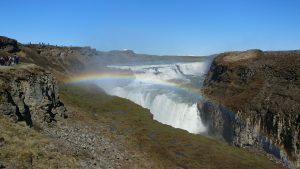 We started with a somewhat hectic breakfast at the hostel but eventually herded everyone together and hit the road as tourists following the Golden Circle. We started off visiting the Hellisheiði Power Plant. Iceland is positioned over the Mid-Atlantic ridge, hence the many volcanoes in Iceland, and geothermal power plants such as the one we visited harness the energy from the hot water to provide electricity and hot water to Reykjavik and other parts of Iceland. After a cloudy start to the day, the winds blew them away and revealed the sun as we visited the Kerið crater. Kerið was a volcano which erupted then collapsed after it’s magma chamber emptied. 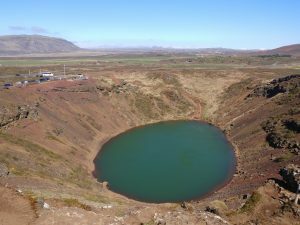 We trekked a path that encircles the crater, tried not to be blown over by the wind, and then walked down to the lake at the bottom. A parking lot lunch was enjoyed by all, as we munched on sandwiches and GORP. Then we drove on to visit the huge waterfall Gullfoss. With the sun shining we were able to see a double rainbow in the mist! We planned to visit Geysir (from the Icelandic verb geysa, “to gush”, the verb from Old Norse) but we’d spent so much time at other sites and still needed to get to Þinvellir. But through the van windows we were still able to observe (mostly) steam coming from the ground as we drove past. At Þinvellir we tested out the drones and got them flying before exploring the rift valley which was the original site for the Althing, the Icelandic parliament. 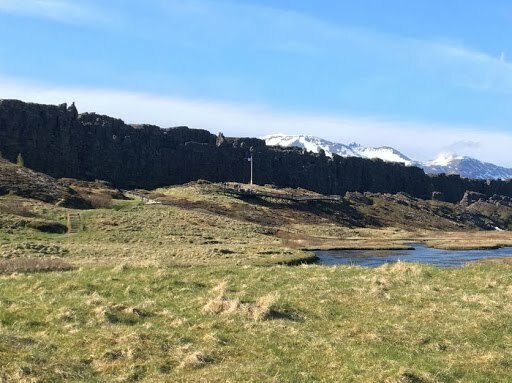 Here we were able to see the results of continental drift in person: faults (cracks) from the separation of the North American and Eurasian plates. It was a lot of fun walking around and great weather for gazing at the glaciers in the distance (thanks to great weather)!